Today my phone has been ringing, ringing, ringing. I lost track of how many phone calls I have gotten. It is usually not this bad, but today it has been. I see many, but not all, of these phone calls as interruptions to our day. I have only answered one of them today so far. When we are busy with our homeschool day, I want to devote my attention to my children. That is why I am so thankful for an answering machine! I can let those calls go through to the answering machine, and I can return them at a more convenient time. If you do not have Caller ID, you can let your calls go through to the answering machine to screen them. That is much better than being interrupted all day by people who are either a) solicitors, or b) can wait. Maybe some people won't understand why you can't answer the phone all the time, but as homemakers, we have to prioritize our time and use it wisely. How do you deal with phone calls during the day? I try not to talk on the phone when the girls are awake, first because they go a bit crazy when I use the phone and secondly I have a hard time letting the person on the line understand that my time is worth something and that the girls needs my attention during the day. All our phone calls come through the mobile phone so its not hard to leave some to voice mail and answer those that are important. I do answer calls that are from my parents (as they are old), my children (are now adults) and my brothers (as it maybe important). I quite like people to text me as these are very easy to read and determine whether to phone back quickly or not. Great photo! I love those old candlestick phones. We only use cell phones these days, but one thing I miss about our old land-line phone was the ability for multiple people to talk on extensions. Placing calls on speaker-phone is somehow not quite the same. I also miss the chance conversations that used to happen with whoever answered the phone, even if they weren't the person I was intending to call. For example, I'd call my brother but also get to chitchat with his wife when she answered the phone. Now everyone has his or her own individual line. It sounds like texting is a popular option for many. I don't have that option, though. 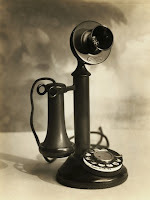 There are some disadvantages to having only a cell phone...I am glad I still have an "old-fashioned" landline.